Step into a fairytale version of the Middle Ages in Rothenburg and visit a medieval castle that’s been described as a miniature Versailles. Spend a relaxing day onboard as your ship wends its way along the Main River between Würzburg and Bamberg. It’s something of a truism to say that this route takes you from wine to beer, and you’ll see the transition as you sail past the vineyard-covered slopes around Würzburg toward Bavaria’s famous beer-brewing center, Bamberg. Along the way, you’ll pass delightful little villages and romantic castle ruins, drift under lovely old bridges, and have plenty of time to observe the fascinating variety of vessels plying the river, from heavily loaded barges to jaunty little pleasure craft. Your floating time machine takes you to Bamberg today, a well-preserved town that offers a fascinating glimpse of medieval times. Explore the city on foot or opt to head deeper into the Franconian countryside to experience an authentic slice of rural life—including a tractor ride! Today, your ship will dock in the UNESCO World Heritage city of Bamberg, which has one of the largest intact medieval town centers in Europe. Like Rome, the city is built on seven hills—but in Bamberg, a church tops each one. During the Middle Ages, Bamberg was split in two, divided by the Regnitz River, one side controlled by the prince-bishop and the other by the burghers (a formally de ned class in medieval Germany). As a result of this division, the Old Town Hall was built on a tiny island in the middle of the Regnitz to serve both sides of town. Marvel at this medieval city’s striking architecture and stirring history on a walking tour through Bamberg’s Old Town. Or leave the city behind for an experience of Franconian rural life with a visit to a charming village in the verdant hills just outside of town. Passau is a crossroads in more ways than one—three rivers meet here and three nations nearly do, making for a fascinating cultural mosaic. Get to know the town with a choice of guided walks. Located at the confluence of three rivers—the Danube, Inn and Ilz—Passau is well known for its ornate baroque cathedral. Long ago, it was a Roman colony in the province of Noricum, called Batavis after an ancient Germanic tribe. Today, the city is unusually well preserved, having been spared the brunt of Allied bombing during WWII, as you’ll see on your walking tour of Passau. Named for its white church, Weissenkirchen may very well be the prettiest village in the Wachau Valley. A local expert will show you around and introduce you to some regional delicacies; later, you can stretch your legs with a vineyard hike that includes a wine tasting. Prefer to go for baroque? Visit the 900-year-old Melk Abbey and its extraordinarily opulent library. Sail through the spectacular scenery of the Wachau Valley—one of the most beautiful stretches of river landscape in all of Europe. The 19-mile-long (30-kilometer- long) valley was formed over many centuries by the Danube River, which slowly wore away a rocky gorge in the foothills of the Bohemian Forest between Krems and Melk. This enchanting region—which boasts steep-sided, densely wooded southern slopes and northern slopes composed of a picturesque mixture of crags and vineyards—is a UNESCO World Heritage Cultural Landscape. Dotted along the banks are boutique winemaking communities and historic small towns, like the pleasant village of Weissenkirchen, which you will have the opportunity to explore on a delightfully savory excursion. Or, if you’re feeling active, consider a vineyard hike that will lead you high above the village. Some of Austria’s nest white wines are produced from grapes ripened on the terraces that cling to these rocky slopes, including Grüner Veltliner, which is grown almost exclusively in Austria. If you have a taste for history rather than wine, consider a visit to Melk Abbey, where you’ll explore its massive library and admire its magnificent architecture. Located on opposite sides of the Danube, Buda and Pest each has its own distinctive character and charm. Get acquainted this dynamic and multi-faceted city with your choice of excursions—whether you see it on four wheels or on your own two feet, there is much to discover in the Hungarian capital. Called the “Queen of the Danube,” in part because of the way the city hugs the banks of the river, Budapest is an enchanting city that vibrantly mixes East and West, medieval and modern. Made up of two parts—Buda (the hills) and Pest (the flatlands)—and divided by the Danube, Hungary’s capital presents an array of architectural styles that reveal its long and varied history. You’ll have two enticing ways to experience the city—a panoramic guided tour aboard a motorcoach, or discover the Budapest that locals love on a special walking tour. 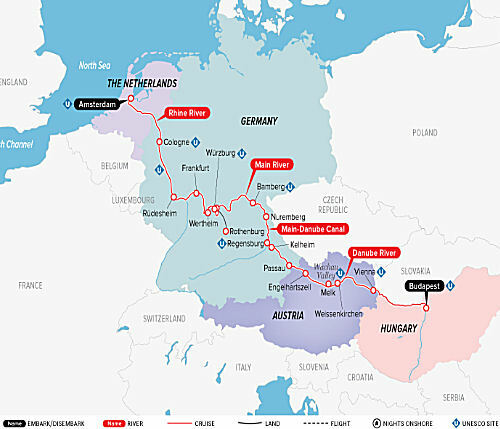 Indulge your passion for majestic art, architecture, music and history on an all-encompassing journey through four countries along three great rivers— the Danube, Main and Rhine—and to numerous UNESCO World Heritage sites. From exotic Budapest, “Queen of the Danube,” to imperial Vienna, “City of Waltzes,” to the sky-high spires of Cologne’s Gothic cathedral—centuries of intriguing history and culture unfold before your eyes. The Melk Abbey’s great library overlooking the Danube and the Würzburg Residence’s soaring ceiling fresco by Tiepolo will leave you mesmerized. And throughout your journey, tantalize your senses with exclusive wine, apricot brandy and beer tastings, along with regional culinary delicacies. Discover the grand sweep of history and the dynamic present along legendary rivers on a magnificent journey that gives you the best of Europe’s great treasures as well as off-the-beaten-path gems. Who will enjoy this cruise? Travelers wishing to discover the full spectrum of European culture, history, art and architecture; and connoisseurs of fine food and world-class wine. Prices exclude additional port charges of $400 per person.